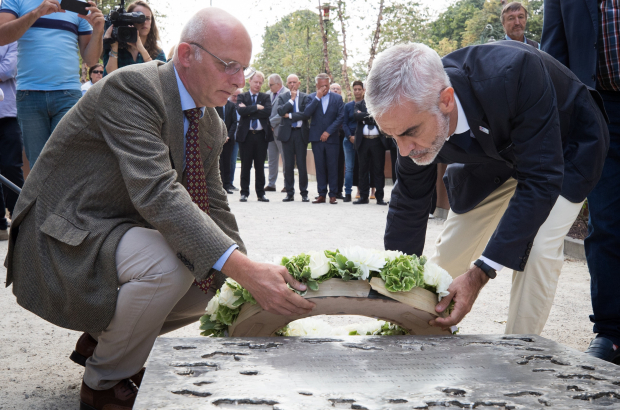 Philippe Vansteenkiste, chair of V-Europe (left), and João Lázaro of Victim Support Europe laid a wreath at the national monument for victims of terrorism in Brussels on 21 August, the first annual International Day of Remembrance and Tribute to the Victims of Terrorism. The day was designated by the United Nations to stand in solidarity with the victims of terrorism worldwide. A commemoration was held in Brussels at the monument, established last year to recognise the victims of the March 2016 terrorist attack that killed 32 people in Brussels Airport and Maalbeek metro station. The monument is located at the Schuman round-a-bout, near the metro station. Vansteenkiste lost his sister in the bombing and last year co-founded the victims’ support organisation V-Europe. The non-profit supports victims of terrorist attacks in Europe but particularly on Belgian soil, as well as Belgian victims around the world. Also at the ceremony were the members of the 2016 bombings’ federal parliamentary investigative committee, including Patrick Dewael (Open Vld) and Meryame Kitir (SP.A).